Absolut Art Bar in Stockholm by Swedish DJ duo Studio Barnhus, also the stage for 2017's Absolut Art Award celebration. How visible does Absolut want its product to be? What about its brand visibility? For Absolut, collaborations with artists are about our ongoing commitment to the arts and representing our core brand values. By working with artists and the creative community we maintain our relationship with this audience and in addition, we create new and exciting avenues to explore. Art’s ability to transcend beyond its core audience and entice people allows us to constantly develop how we communicate with people. Why has Absolut shifted away, somewhat, from the popular Art Bar programming? Is there a rationale to becoming more systematic and less experience-focused? 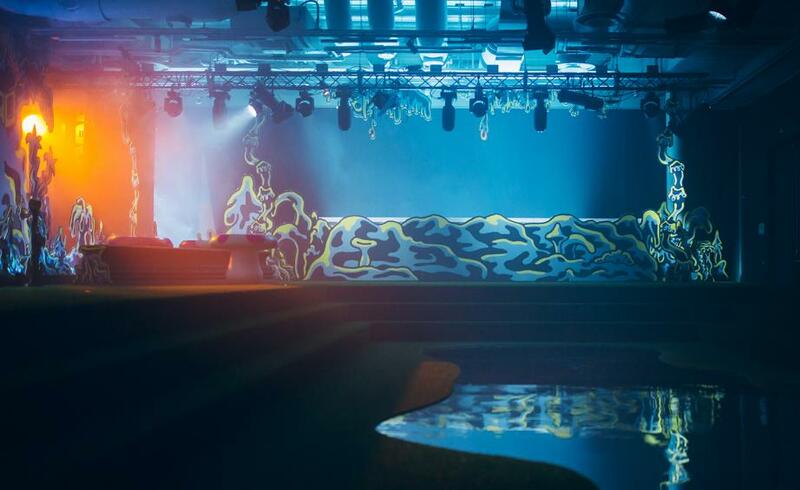 We are still creating Absolut Art Bars all over the world. Recently we collaborated with Studio Barnhus on an immersive Art Bar titled Mareld, meaning “bioluminescence“. Set in the heart of Stockholm in Sweden, the site-specific installation featured imagery by artist and illustrator Leo Hallin. In the meantime, we are constantly exploring new ways to collaborate with artists, writers, designers and other creatives through a myriad of projects, experiential platforms and advertising campaigns. What are the core corporate values being relayed in the Absout Art Award, and how do they dovetail with the way the artist and critic are selected? Absolut Art Award was instituted in 2009 to mark the brand’s 30 years of creative collaborations with artists. In 2012, we refreshed the format to include art writers to support the development of critical theory. The winners are selected by our distinguished international jury, who change with each award cycle and are comprised of curators, museum directors and other artists. The brand team has no involvement in the selection process for the Absolut Art Award winners. What initiatives are you working on at the moment? I am currently working on supporting our two 2017 Absolut Art Award winners with realising their winning proposals. Anne Imhof is producing a new work set in the salt deserts of Death Valley, California. Huey Copeland is working on the proposal for his book Touched by the Mother, a collection of essays offering a multi-faceted perspective on American art methodology and its discourse over the past fifty years. We will be announcing further details about their projects in 2018.